Saying goodby to Sullivan Bay, we took advantage of a good weather window to cross Queen Charlotte Strait. We were just entering the Strait when my heart about jumped out of my body. As I glanced to the starboard side, I was looking at a large humpback whale no more than 10 feet from the boat. Before I could get the words “Whale” out of my mouth, he disappeared under the boat. No picture of this one. The small fishing town of Port McNeil is our destination. 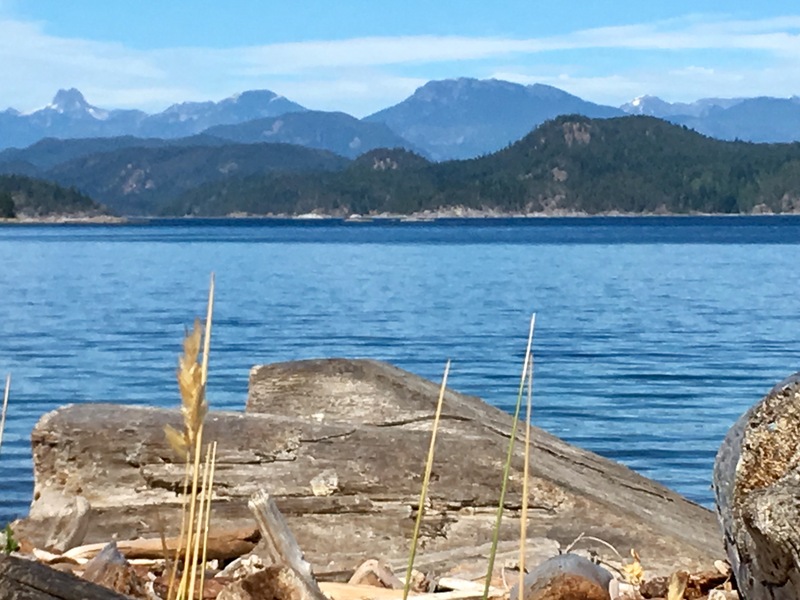 Located on Vancouver Island, it is a resupply stop for most boaters. There is a nice IGA grocery store just up the hill where we restock our fresh vegetables. More importantly, the marina takes garbage. 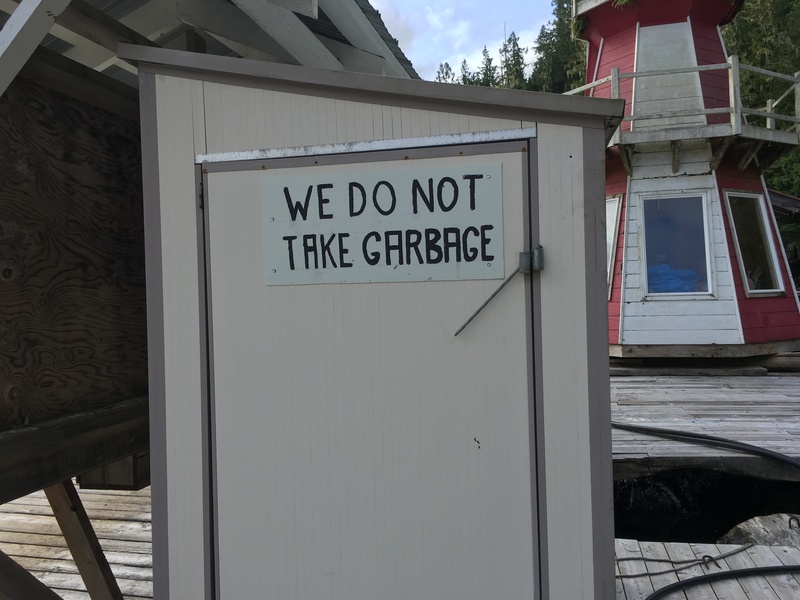 Most marinas in the Broughtons and Desolation Sound do not take garbage. It is just too difficult logistically for them to get rid of boaters trash. Garbage was one of our most challenging problems encountered this year. After a month of cruising, we are very happy to find a dumpster. Who ever thought we would be happy to see a dumpster. 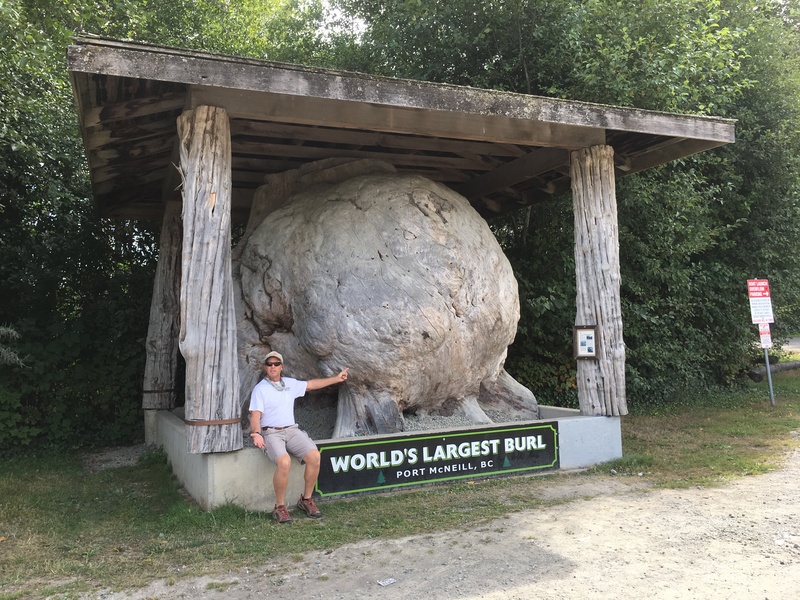 Port McNeil’s big tourist attraction is “The Worlds Largest Burl”. This burl was donated to the town by Western Forrest Products in 2005. It came from 525 year old Sitka Spruce tree. The marina is also home to a large fishing fleet. 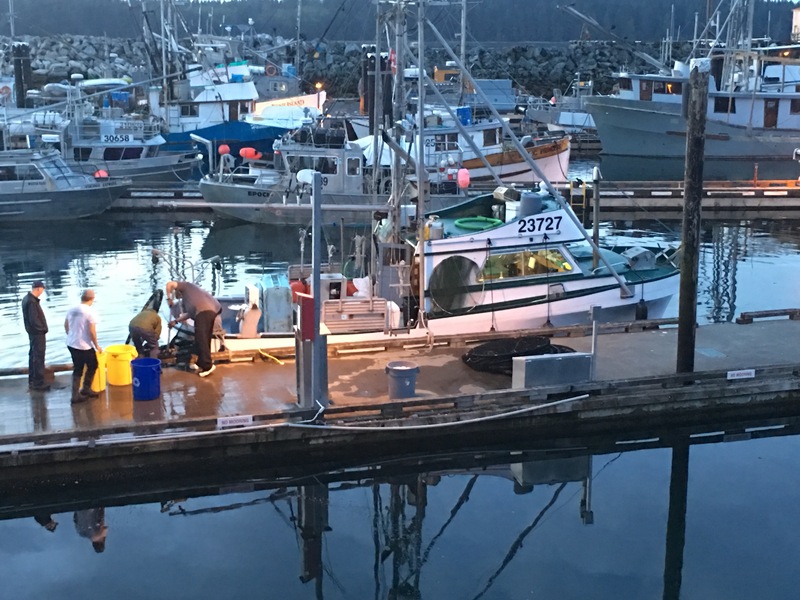 One evening, we watched as one of the fishing boats unloaded their catch of 4000 pounds of Rock Fish, Black Bass, and Lingcod. A large truck with water boxes was there to haul the precious cargo to market. This catch was destine for Chinatown in Vancouver City. While talking with the crew, we learned that all of the fishing boats are required to have video cameras recording their fishing activity. There are many areas that are Rock Fish conservation areas and no fishing is allowed. 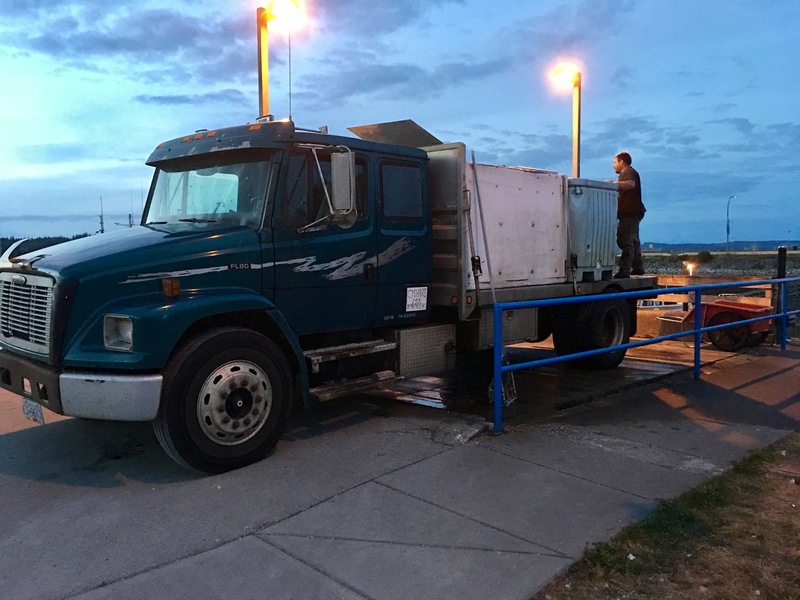 When a fishing boat arrives in port, someone from Fisheries comes to the boat to inspect and log their catch. They also check to see if the video matches what they have aboard. If there is no video, they can not sell their fish. It is heartening to hear that Canada is monitoring their fisheries so closely. 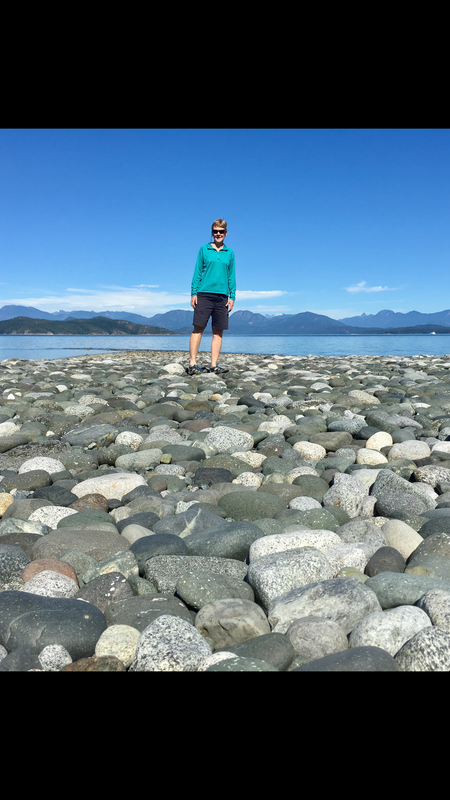 With another good weather window, we spent two days traveling down the 54 mile long Johnstone Strait to Desolation Sound. This can be a challenging body of water with two rapids to traverse. Flanked on both sides by steep high mountains , winds tend to funnel down this narrow waterway. When the wind and swift currents oppose one another, this can be a very treacherous passage. Cruising guides warn boaters to be off the water by noon each day. This is also the major marine highway for all points north. Cruise Ships, barges, and log tows all share this route. Many of the smaller boats use several “backroad” routes which are more protected from the winds. We traveled one of those routes on our trip north. They have their own set of challenges with many rapids to transit. With calm seas we decide to give Johnston Strait a try. We have many bailout options if the seas turn nasty. 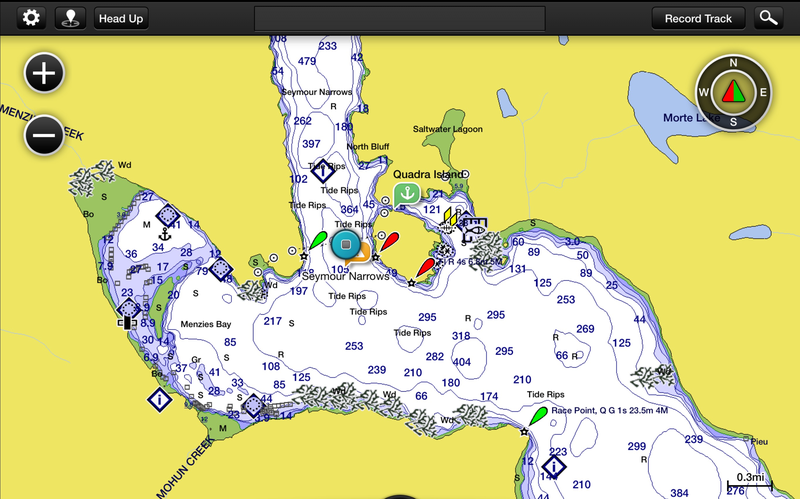 Our first challenge is at Race and Current Passage. Ideally you should arrive here at slack tide. Our projected arrival time is two hours past slack. Our tide book shows that we are on a neap tide. These tides occur during half moon and are smaller than the spring tides which occur during the new moon and full moon phase. If we had been on a spring tide we probably would not transit this passage other than slack. The currents are running pretty fast when we arrive with a few whirlpools. We shoot on through with no issues. After 84 miles, we decide to call it a day and stop for the evening at Camelon Bay. The next morning, we Time our departure to arrive at Seymour Narrows at slack tide. Currents in these rapids run up to 16 knots. Even the big cruise ships only transit these narrows at slack. Arriving 20 minutes before slack, there is a parade of over a dozen boats transiting the rapids. We fall in line behind a coal barge. Luckily there are no cruise ships today. We find the Narrows still turbulent with the dying flood. Idyll Time flys through at 12.5 knots. We are glad to have this rapid behind us. We continue several miles down Discovery Passage rounding Cape Mudge and into Drew Harbor on Quadra Island for the evening. We anchor just offshore of the rocky beach with great views of Desolation Sound from the fly bridge. This entry was posted on September 16, 2017 at 11:12 pm. You can follow any responses to this entry through the RSS 2.0 feed. You can leave a response, or trackback from your own site.